Amigurumi Today is created for crochet lovers and fans of amigurumi art. Here you will find interesting ideas and lots of free amigurumi patterns and step-by-step tutorials. Draw inspiration from the works of talented designers! 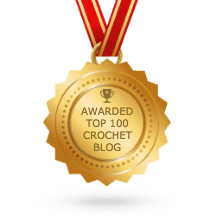 Amigurumi Today is honored to be displayed in Top 100 Crochet Blogs list. Besides the website, you can find free amigurumi patterns in our mobile app. Copyright: reproducing, copying and distributing patterns published on https://amigurumi.today are strictly prohibited!